There are many theories how the human race began. Relatively recently, Science concluded that all of us share a common female ancestor. In recognition of the biblical account they even called her Eve. The life that Adam and Eve had in the Garden of Eden before they sinned is the ideal state that, collectively, we always have in the back of our minds no matter how bad or good life is. The power of the individual is incomprehensibly great; one person can change the world. Adam and Eve in the Garden of Eden before they sinned represent ideal humankind. That’s humankind that doesn’t know death or sickness; that does not have to work for a living; that has a healthy diet of fruit and vegetables in the Garden of Eden. They are in a spiritual existence even as they exist on the physical plane. They live in the perfect world, Utopia. Then they’re driven out of the Garden of Eden — and driven out with what sounds like a curse: By the sweat of your brow you will be able to bring forth food (Genesis 3:19). They are driven out into a dangerous world, a world of beasts and wild animals; a world of floods, tsunamis, earthquakes and volcanoes; a world with a life and death struggle to survive. They are driven out into the “real” world. As a result, there is a piece within us, the Sages say, which always remembers the perfect world; that remembers that we were once in the Garden of Eden. It’s part of our DNA, our genetic makeup, so to speak. That’s why human beings are restless and constantly looking for new things; that’s why we get depressed and dissatisfied. There is a piece within us that says there is something better than this; we had it at one time, lost it, and would like to get back again. That drive fuels everything that human beings do. It is a very remarkable insight. Nevertheless, dissatisfaction is part of human nature, because we remember deep down in our souls that we were once in the Garden of Eden, and we would like to get back there. In the 18th century, the world was infected by the Marxist idea that human beings don’t count. There are forces, economic and social, that govern all of history. They are immutable forces that no one can change under any circumstances. The collapse of capitalism and rise of communism are historic forces, and human beings do not play a role. The corollary is that the individual has no worth. The only thing of worth is the state… the idea… the party. Not surprisingly, then, Chairman Mao killed 80 million Chinese to bring about the great, new utopian China. Stalin killed 50 to 60 million people to achieve his communist utopia — and then the Soviet Union disappeared. Nevertheless, all those people are dead. They died because the individual did not exist in the Marxist ideology. On the other hand, if you look at the stories in the Bible they are not stories about nations and empires, but about people. The backdrop is the empire, but the story is about the person. The story is about Abraham. The story is about Isaac. The story is about Jacob. The story is about King David, Isaiah and Jeremiah. Where they lived, what went on, etc. are backdrops. In the Bible, people are important. According to Jewish legend, the world exists in the merit of 36 righteous people. The city of Sodom, which had millions of evil people, was destroyed not because of the millions of evil people, but because it didn’t have 10 good people! The few righteous who lived there were not enough to change the society. Why does God tolerate our world? Every day it’s another scandal; another murder; another war. You have to take a shower after reading the newspaper! Why does God tolerate it? Because there are still good people in the world. It’s the good people that keep the world going. Our task is to be one of the good people. That’s the Torah’s viewpoint. A few good people make a difference. After Adam was thrown out of the Garden of Eden, he was in a difficult situation. Worst of all, he was depressed. There is nothing more depressing than getting kicked out of Paradise. At the root of his depression was the realization of his mortality. There’s a book by the famous psychoanalyst, Ernst Becker, an American soldier in the United States army who helped free the concentration camps. He was also a Jew, and was very heavily influenced by what he saw. (At the end of his life he became a religious person.) He wrote a book called The Denial of Death. The thesis of the book basically is that everything that people accomplish in life is based on the fact that we know that we are mortal. Therefore, in order to succeed, human beings have to deny it. Otherwise, nobody would get out of bed in the morning. The Denial of Death is a startling book. The fact that we know that we will be around for only 70, 80, 90, maybe 100 years, influences everything that we do. Consequently, life is treasured simply because of our awareness of death. And that is one reason why, the Sages said, that God gave us the Torah: to help us hurdle these obstacles and reconcile our mortality. Adam wrestled with his mortality after the Garden of Eden. Eventually, he found the wherewithal to go on, which teaches another great lesson. Despite everything, human beings possess a great character trait that can trump everything else: resilience. The measure of righteousness is resilience, the ability to pick oneself up off the mat. Jews are the prime example of that. Who else could undergo the First World War, the Communist Revolution, the Holocaust and then rebuild like the Jewish people? Resilience is our name. In early civilization, men were generally farmers or hunters. While advancing civilization, these two occupations nevertheless lowered the bar of piety. The Sages said that piety doesn’t belong to the unlettered or ignorant. By that they meant that it doesn’t belong to people who lack the power of abstract thinking, because to deal with God you must have the ability to see things that cannot be seen. This is especially true of monotheism, with its unseen God. The Romans called the Jews atheists, because they couldn’t see the God that the Jews were worshipping. They needed a statue, a form or some sort of symbol. Before the Flood, the majority of people lost their ability to think abstractly. The great Hasidic rabbi, Levi Yitzchak of Berdichev, said that a man can be for or against God, but he cannot be without God. Atheism is also a religion. It has its own rhythm and laws; its own books… as well as its own faith. You have to believe that there’s nothing to believe in, which is actually the expression of an inner drive within us to believe something, especially in a world that constantly blindsides us, that constantly spins forth tragedy and illness, etc. That’s how paganism began, Maimonides writes. Maimonides doesn’t call what they did a “sin,” but rather an “error.” They made a great error. The error was rooted in their inability to think abstractly. Einstein thought about things that nobody ever saw. When he was 12 years old, he imagined what it would be like to ride a beam of light. From that childish idea, he eventually came to his theories of relativity. Maimonides said that anyone capable of abstract thinking is potentially a believer and that paganism entered the world through the loss of abstract thinking. Why did they lose their ability to think abstractly? Because it was so difficult to live, to get food, to hunt, etc. And the world was full of violence. Tribes fought each other; brothers fought each other. In such a climate, it is very difficult to sit back and think what it’s like to ride a beam of light. This helps us better understand the Flood. The Sages saw the Flood not as a punishment, but rather as the means by which God gave humanity a chance to realign its values and goals. It was the salvation because humankind was so overcome with violence and lack of respect for other human beings that if God had not brought the Flood, humanity would have destroyed itself. The Flood actually saved humankind from itself. We live in a time with a lot of similarities, where the danger of humanity destroying itself is real, God forbid. There are madmen like Kim Jong-il, Ahmadinejad and others with the ability to push a button and set the world on fire. Who will save us from that? Who will save human beings from destroying the world itself? Maimonides says that when it looks like there is no hope — that’s when God intervenes. Back in the early days of civilization, the intervention was through the Flood. Then God promised that there would never again be a Flood, another intervention of such a magnitude. If human beings come to the state that they’re going to destroy the world as we know it, God will certainly intervene. How the intervention will come is unknown, though if you read the apocalyptic descriptions in the prophet Zachariah, and in other books of the Bible, the descriptions of how the intervention will take place are fairly graphic. In any event, everything about the story of early humanity is very relevant today. The main problem in modern life is how to balance the checkbook, who is going to take out the garbage, who has carpool, etc. We have no time to think. That’s the same struggle at the dawn of civilization. Our struggle is to somehow rise above that. 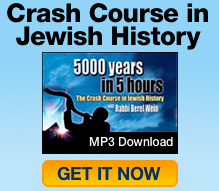 The Torah is not primarily history. It’s about destiny. It’s about revealing a mirror to our past in order to teach us how to thrive in the present and create a corridor of hope for the future. Paganism, a result of the lack of abstract thought, an interesting theory. As humans we become more logical thinkers as we mature. However many times I notice that once someone hits a certain age group that logic descends back to the abstract thoughts of a young person. Wonderful!! Excellent perspective the Dawn of Civilization which was in no way what I had expected at the outset of my read. I am in the research phase of writing a book and came across you website and felt it imperative that i take a gander. Well, this gander has turned out to be well worth my time. I am all the more enriched by your work here. Blessings to you! I look forward to the remainder of your crash course.